I can only speculate on the reason why, but the rat race of Wall Street and the government-managed retirement system has many people looking for new options. Using FiscalBridge and the “Without The Bank” strategies will benefit anyone looking for a better way to manage and create wealth. The strategy to use Whole Life Insurance as a tool to house and create wealth is 100+ years old. With correctly structured Whole Life Insurance, you don’t have to take risks in the market or give up access to your money. The Infinite Banking strategy has major tax benefits as you retire. How much do you charge to help me? I don’t charge for you to come visit with me. This process is about you learning to manage your money in an efficient manner. Money never exchanges hands, if you should decide to write a policy I get paid commission from the insurance company. It is my job to teach and help you through this process. If you decide it’s not for you then you walked away smarter then you arrived, my job is complete. Can anyone help me set up this strategy? Let me be completely transparent with you. This is not something that most financial advisors and life insurance agents know enough about. In fact, I’ve had to correct multiple agents and deliver bad news to policyholders. I am a certified infinite banking consultant, I specialize in whole life insurance and I work with clients in all 50 states. What if the insurance company goes under? If the insurance company should file bankruptcy your state will have some securities in order. In our home state of ND, the insurance department guarantees up to a $300,000 death benefit and $100,00 cash value. If you are unsure of your state, contact your insurance department or find them online. Also, in most cases, a larger company will buy out the bankrupt company out and policies will remain in force. How soon can I borrow against my cash value and start financing my purchases? The companies we represent allow you to borrow against your cash value as soon as your premium check clears the bank. Does the insurance company ask me what I am using the cash value for? How soon do I have to pay back my loan? Can I pay the loan back monthly, quarterly or in a lump sum? Yes, you can pay it back any way you like. It is your loan, you make those decisions. Can I see my cash value balance online? Yes you can setup an account for yourself on the company’s website. AUL is www.oneamerica.com and Lafayette is www.llic.com. You will need your policy number in order to do this. When I die, do my heirs get the cash value and the death benefit? No, only the death benefit. It is similar to your house. When you sell your home do you get the equity and the sale price of the home? No. Who is able to work with Mary Jo and the FiscalBridge team? 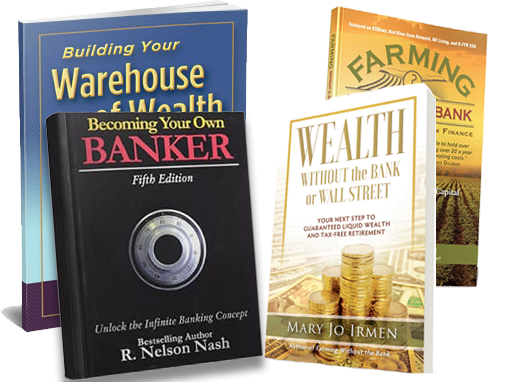 I work with everyone from entrepreneurs to employees from across the United States, my only requirement is that Wealth Without The Bank or Wall Street OR Farming Without The Bank is purchased and read prior to our first conversation. This saves 6 to 8 hours of meeting time and gives the reader time to think, understand, and prepare questions. Is there more information available about this wealth strategy? Yes, I highly recommend any of these books. There is more to learn about infinite banking and the Without The Bank strategy. I am happy to share more information. Let me know how I can help.